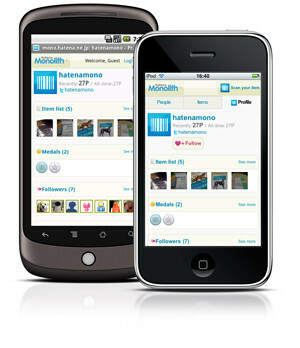 Today we released a new online service called Hatena Monolith for smartphone users. The word "Mono" in Japanese literally means "things" or "stuff." Hatena Monolith allows you to scan barcodes from any kind of stuff that exists around you. You can use Monolith to easily keep track of your collections or to introduce things you like to others, and enjoy sharing information in a whole new way. After you install Hatena Monolith for your iPhone 3GS or Android device, you'll be able to scan barcodes and share your stuff on the web. You can also simultaneously post your Monolith entries to Twitter. We will be posting information on this blog from time to time about new features for the service, as well as information about our policies and other important stuff. Thanks for taking the time to check out Hatena Monolith, and we hope that you enjoy this new service from Hatena.